Below are tips to protect your pet during this winter’s cold. If it is too cold for you to be outside, it is too cold for you pet. 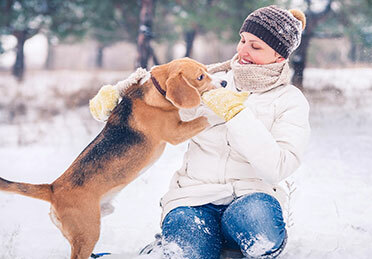 Be mindful of the amount of time your pet spends outside during the cold win¬ter months. Exposure to freezing temperatures can lead to frostbite and hypothermia, even after a short period of time. Provide small dogs or those with thin hair a coat or sweater if going outside. If letting your pet out into the yard for a potty break, it is always best to stand by the door and call them back inside immediately after they’ve finished. Standing by the door until your pet is ready to come back inside can limit the risk of be¬coming distracted by something else going on inside the house and accidentally leav¬ing them out in the cold for too long. It is also best to limit the amount of time spent on walks during the cold winter months in order to avoid over-exposure to frigid tempera¬tures. Walks should be just long enough for your pet to use the restroom. Common chemicals used during the winter months can be hazardous to pets. This includes many anti-freeze formulas, as well as rock salt that is typically sprinkled onto sidewalks to melt ice and snow. Extreme caution should be used when storing anti-freeze, as many formulas contain ethylene glycol, which can be deadly if consumed by a pet. Although rock salt is not typically deadly, it can cause burning and irritation if in contact with a pet’s paws, in addition to stomach irritation if licked from the paws and swallowed. A simple solution for avoiding contact with rock salt is to purchase pet booties for your pet to wear when outdoors. Wearing the booties will also aid in keeping your pets feet dry and warm. If providing your pet with a coat or sweater for the winter weath¬er, waterproof is always best. When outside in the winter months, there is always a chance that your pet may come into contact with ice, snow or slush, which can saturate a non-waterproof clothing item. A cold, wet piece of clothing can end up doing more harm than good. Pets should never be left unattended aorund warming/heating de¬vices, such as space heaters, electric blankets or open flames. If a pet is cold, they may get too close to the warming device, which can put them at risk for burns or potential further damage if the device is knocked over. If a pet is experiencing a medical emergency, pet owners are encouraged to immediately contact their family veterinarian or MedVet for guidance and help.